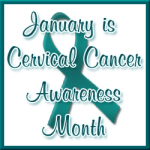 Cervical Cancer Awareness Month is an annual observance in January to raise awareness of cervical cancer prevention, causes, diagnoses, treatments and survivorships. The Centers for Disease Control and Prevention report more than 12,500 women were diagnosed with cervical cancer in 2014. Women between the ages of 21 – 65 should receive a routine cervical cancer screening with a Pap smear every 3 years; women ages 30 – 65 can also receive a Human Papillomavirus (HPV) test with their Pap smear every 5 years. HPV is a common virus that causes nearly all cervical cancers. Protect yourself and loved ones from cancerous types of HPV by getting the HPV vaccine; people between the ages of 9 – 26 old can receive the HPV vaccine. Keep yourself and your loved ones free from cervical cancer and HPV by talking with your doctor about getting a Pap smear and the HPV vaccine.